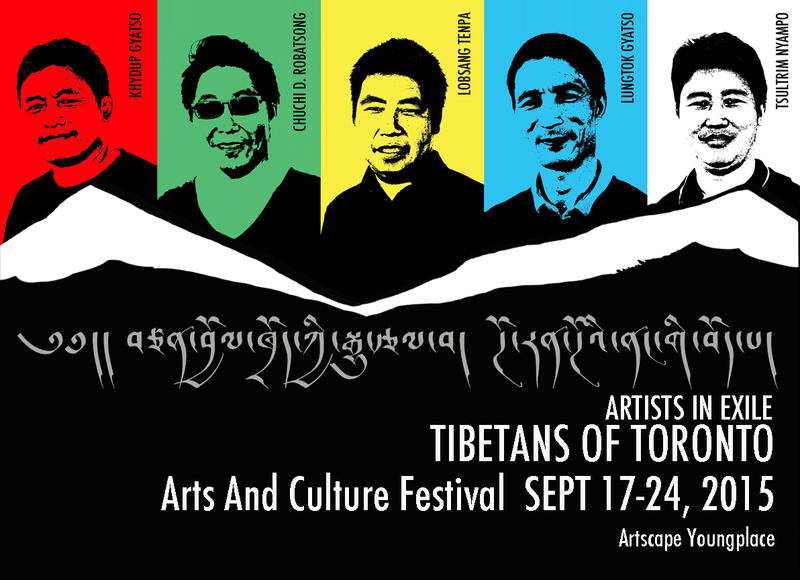 Artists in Exile: Tibetans Of Toronto is a weeklong arts festival featuring local Tibetan-born artists Chuchi Dhondup Robatsong, Khydup Gyatso, Lobsang Tenpa, Lungtok Gyatso, and Tsultrim Nyampo. Having fled their homeland, where their culture has been suppressed by Chinese occupation since the 1950’s, these artists have found refuge here in Toronto, home to one of the largest Tibetan exile communities outside of Nepal and India. This festival is a unique opportunity to hear their stories of life in exile and experience artworks steeped in a distinct cultural and spiritual heritage as presented by contemporary Tibetan-born artists. As part of the Artscape Youngplace open studio event “Recess”, we will be kicking off the week’s festivities Sept 17 at 5:30pm with an Opening Ceremony And Celebration including live performances and traditional Tibetan foods. The week’s program will feature a standing art exhibition, butter sculpture workshop, Wild Yaks storytelling event, an Introduction To Tibetan Buddhism and Meditation led by Khenpo Tsultrim Namdak Rinpoche and a Jayu Speaks panel discussion that includes the exhibiting artists and guests. A HUGE THANK YOU to our partners Artscape Youngplace, Jayu: Human Rights Film Festival, Coffee Pubs, Centre For Social Innovation, McWood Studios, Shangri-La Restaurant and Annex Improv. We could not have done it without your support! A HUGE THANK YOU to Sungjang Rinpoche, Kevin Nadjiwon and Cheri Dinovo (MPP for Parkdale-High Park) for joining us at the Opening Ceremony And Celebrations !! This festival is produced by the Bureau Of Power And Light art collective and Andrea Paras, Assistant Professor of Political Science at the University of Guelph.